Our selection of High Chairs are designed to provide children with high quality seating for use in restaurants, dining rooms, in-room use and more. 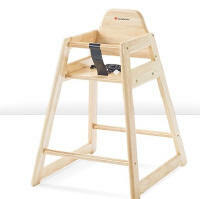 We offer stackable wooden and Stackable Plastic High Chairs. The exclusive stackable KidSitter Multi-use High Chair by Koala, which acts as a high chair or an infant car seat holder is a popular offing. 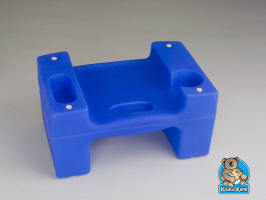 Stacking High Chairs and Booster Chairs by Koala are also now part of our product offerings. Click here to view Table Placemats including Fingerplay, Two-Sided Color Mats and One-Sided Theme Mats that are great for occupying little guests at the table. Click here for High Chair Safety Information. Little diners will be safe and secure in the bacteria-resistant NeatSeat™ Food Service Hardwood High Chair. Durable solid hardwood construction with Durable, bacteria resistant finish. Passive crotch restraint. Meets or exceeds the ASTM F404 safety standards. AVAILABLE IN CANADA ONLY. All edges are rounded for safety and a more finished appearance. Stackable up to four high using a small footprint to reduce storage space. Dual action buckle and adjustable harness for added security. Meets or exceeds the ASTM F404 safety requirements for passive restraints as well as stability, static overload and product safety labeling. The new Stackable Commercial Plastic High Chair is the next stage in convenience and affordability in restaurant seating for young children. It is made of durable plastic that is easy to clean, maintain and weighs 35% less than other plastic chairs. Available in Gray/Gray or Brown Black to compliment any decor. Available in Canada and the US. The new Eco Chair is the first manufactured Commercial Plastic Stackable High Chair that is made from 100% recycled plastic. The Eco Chair boasts a roomier, more comfortable alternative to conventional commercial high chairs. Ships unassembled or assembled. Available in Black-02, Light Gray-01 and Dark Brown-09. Available in Canada and the US. Available in Black, Grey, Red, Brown. Constructed of seamless solid HDPE plastic, more durable and sanitary compared to wood. Textured surface resists scuffing, chipping and scratching. Screws are set flush, no crevices or seams. Chair can be power-washed and is dishwasher safe. Meets the latest ASTM international safety standards F 404-08 and EN 14988-1:2006. Standard table height allows child to be seated at a standard restaurant table, eliminating the need for a tray. 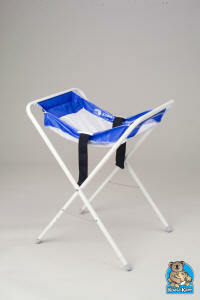 The KidSitter can be used as a High Chair or Infant Seat Carrier to Safely hold children. It is made of durable plastic that is easy to clean and maintain. Available with or without casters. Chair available in Grey or Dark Brown (New!!). Seat available in Dark Brown, Dark Grey, Red, Blue, Black. Available in Canada and the US. 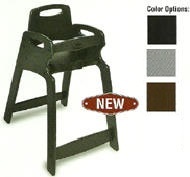 Easy conversion from High Chair to Car Seat Carrier. 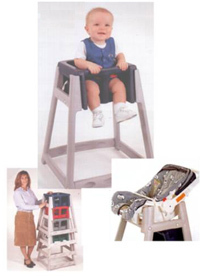 High chair seat rotates under the frame to create infant seat carrier. 6820JC/TK 5" 22" 22" 15½" 14 lbs. 6821JC/TK 7" 22" 22" 17½" 15 lbs. 6822JC/TK 9" 22" 22" 19½" 16 lbs. 6823JC/TK 11" 22" 23" 21½" 17 lbs. 6824JC/TK 13" 22" 23" 23½" 18 lbs. 6825JC/TK 15" 22" 23" 25½" 18 lbs. 4705047 5" 18.25" 17.75" 14.75" 9 lbs. 4707047 7" 18.5" 18" 16.75" 9.5 lbs. 4709047 9" 18.75" 18.25" 18.75" 10 lbs. 4701047 11" 19" 18.5" 20.75" 10.5 lbs. 4703047 13" 19.25" 18.75" 22.75" 11 lbs. 4605247 5" 21.5" 20" 15.5" 9 lbs. 4607247 7" 21.5" 20" 17.5" 9.5 lbs. 4609247 9" 21.5" 20" 19.5" 10 lbs. 4601247 11" 21.5" 20" 21.5" 10.5 lbs. 4603247 13" 21.5" 20" 23.5" 11 lbs. Features of the Secure Sitter Tip & Slip Proof Feeding Chair includ the No Slip™ passive restraint which prevents child from sliding out of seat. No tip feet provide stable base to keep chair securely on the floor. Chairs stack 4 high for space saving storage. Weight capacity is 40 lbs. 1 year limited warranty. Easy assembly includes all necessary tools. AVAILABLE IN CANADA ONLY. Also see Edutray with Educube for a unique eating area for children. 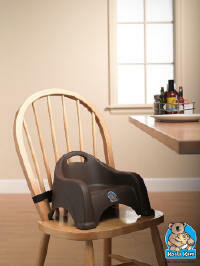 This booster seat is designed to match the KidSitter High Chair with dual heights and wide base for added stability. Available with seat belt - 857. Available in Dark Brown, Dark Grey, Red, Blue and Green. Available in Canada and the US. Constructed of polypropylene, allowing the product to be both flexible and tough. Textured surface hides scuffs, yet easy to clean. Contains Microban® antimicrobial protection, which inhibits the growth of odor causing bacteria. Straps are easily removable for washing. Designed with a tight weave material for quick and effective wipe-down after use. Booster feet are slip scratch resistant. The open design allows easy stacking, minimizing in-store foot-print. No crevices or seams to trap food and dirt. Individual Seat Dimensions: 16¼ W x 7½ H x 11½ D (41.3 cm W x 19.1 cm H x 29.2 cm D) Two optional stands available seats: Small Stand holds 10 boosters, Large Stand holds 25. Available in Canada and US. Built in handle for portability and storage. Flip over design offers a 6” (15.2 cm) lift on one side and a 4” (10.2 cm) lift on the other side. Features a built in cup and snack holder for kids to have their own candy and drink. Helps promote more purchases at the concession stands. 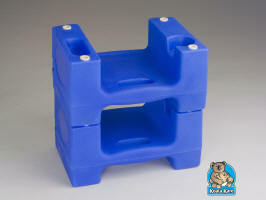 Rubber feet aid in secure seat placement. Optional strap to attach seat to adult chair. Some Products not available in Canada or the US as noted. Contact us for customized service. These Products are UPS Shippable - Contact us for delivery quotes.